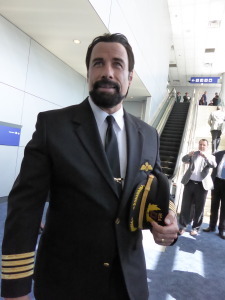 A-list celebrity and Qantas Airways Ambassador John Travolta was on hand Monday afternoon to welcome some lucky arriving passengers (including me!) on the first Qantas A380 jumbo airplane to fly direct from Sydney Airport to Dallas/Fort Worth International Airport. The new service -which will operate six times a week (daily except Tuesday) between Sydney and DFW means that Qantas is now flying the world’s largest airplane on the world’s longest flight. The flight from Sydney to DFW is scheduled to take around 14 hours 50 minutes; the flight from DFW to Sydney will take a bit longer: 15 hours and 30 minutes. 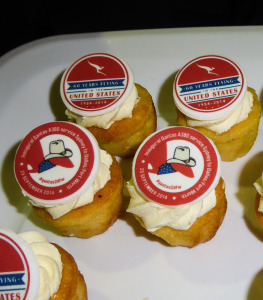 Qantas is also celebrating the new service with some special in-flight menu items between Sydney and DFW, including steak for First Class passengers, Chipotle pork tortillas for Business class passengers, Texas hot dogs for Premium Economy passengers and a variety of snacks and beverages for Economy passengers, including A&W sodas, pulled beef sliders and Route 66 Root Beer.